There are many attractions close to the Hampton Inn in Louisville in the downtown area. Louisville Waterfront Park is only one mile from the hotel. At this park you can sit and enjoy the quiet or have a picnic. There are also many entertaining events held at the Waterfront Park throughout the year. Another great place you may want to visit during your stay at this hotel is the Louisville Slugger and Factory museum. You'll learn about the history of the Louisville Slugger brand of baseball bats. There's also an entertainment district with lots of music and restaurants. 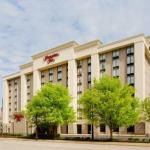 Staying at the Hampton Inn in Louisville is a great choice because they have so much to offer. They provide guests a daily on the house hot breakfast and you can enjoy a martini at the martini bar in the lobby. If you like to read, you can go the library right in the hotel. There's even an airport shuttle service. There are 173 rooms in the Hampton Inn in Louisville. The beds are comfortable and the rooms are clean. The choices for non-smoking rooms are 1 king size in a deluxe room, 1 king size bed, 1 king size bed study with sofabed, 1 queen bed and 2 queen beds. For rooms where you can smoke there's 1 kings size bed, 1 queen size bed or 2 queen beds. You can also stay in one of the spacious suites. The Hampton Inn hotel in Louisville provides many amenities to make things comfortable and convenient for you. Guest room amenities include air conditoning and a easy to set alarm clock. The rooms also have lever door handles and lower or adjustable closet rods. For entertainment, you can watch TV-Cable, TV-Premium, TV-Standard Network and HBO, CNN, ESPN. Convenient amenities are iron, ironing board, lap desk, hairdryer and a coffee maker. You'll also have internet access and telephone with two lines, voice mail and dataport. In the bathroom there's a scald proof shower/tub, cruved shower rod and a shower for wheelchairs. This hotel also provides Purity Basics Bath amenities.